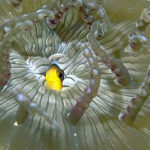 Jean-Michel Cousteau refers to Fiji as “The Soft Coral Capital of the World” for good reason! When first you dive Fiji, the vibrant colors of both the soft and hard corals, as well as the myriad of marine life will exceed your wildest expectations. Built on a solid base of over 400 species of coral and 1200 types of fish, there is a density of marine life here not seen in many other locations around the globe. Fiji’s vast network of barrier reefs protects lagoons and islands alike, creating countless dive sites. As a rule, those areas where reef life and diversity is most robust correspond to areas of high volume water transfer, bringing ever more beneficial nutrients from the deep recesses of the open ocean to the shallower lagoons to sustain the marine ecosystem. Yet, not all of Fiji’s underwater treasures are equally distributed. 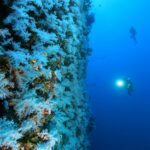 While it is true that you can fall into the water just about anywhere and have an amazing dive, some regions are better suited for specific types of diving than others. For the purposes of this article, let’s divide Fiji into four general regions. Home to Fiji’s oldest and largest Marine Sanctuary, this area is noted for beautiful beaches and an unusually high ratio of sun; perfect for completing your open water certification class, getting an advanced certification or just getting your skills honed again after an extended period out of the water. There are two notably diverse marine environments here: a barrier reef and a massive lagoon. The gentle currents and stress-free environment inside the lagoon make for easy diving, especially suitable for novice and intermediate divers. It is an excellent area to do an introductory dive or take a refresher course. 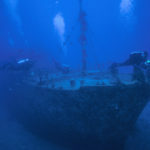 There are bommies, pinnacles and even shipwrecks (An American B-26 Bomber crashed and lies broken on the seabed, and the Salamanda is a decommissioned 130’ cruise ship covered in colorful marine life). Meet sharks up close at The Supermarket dive site, or visit a moray eel feed. See giant clams, banded sea snakes, sea turtles, or schools of barracuda. Around the outside of the barrier reef and in the passages (where the currents run stronger) you can explore walls, ledges, and caves and possibly see mantas, hammerheads, whales, dolphin, schools of Yellow Fin Tuna and even the sporadic docile whale shark. 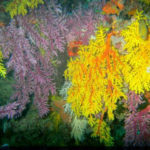 Though lacking some of the adrenalin-laden experiences of the other regions, this area has a wide range of dive options. It is not uncommon to see most of the same marine life here as throughout the rest of Fiji, but generally in a more relaxed environment. 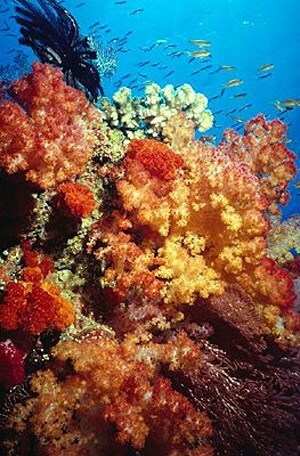 This is by far the largest and most diverse area, and includes some of the most famous of Fiji’s dive sites. Centered around the Somosomo Strait and Rainbow Reef at Taveuni, this area stretches from the Bligh Water and Vatu –i-ra Channel (near Rakiraki) in the west, to the Lomaiviti Group and Lau in the east, and the Great Sea Reef north of Vanua Levu, where much of the diving is still unexplored. This is the playground of the Liveaboards, featuring such world-renowned sites as The Great White Wall, Nigali Passage, E-6, Black Magic Mountain, Mount Mutiny and many others. While many sites are suitable for novice or intermediate divers, this area is also known for strong currents that supply abundant nutrients to feed brilliant soft corals, teeming reef life and also draw in pelagics like hammerhead and other sharks, mantas, and occasionally whale sharks. This is also where the stunning Namena Marine Reserve is located, it’s North Save-A-Tack Passage credited with luring Cousteau to Fiji. Although the liveaboards offer convenience and cover a wide area on their charters, many of the sites they visit are also accessible from land-based resorts. Truly, this region can stand on its own with any other diving destination in the world. Beqa Lagoon is the submerged crater of an extinct volcano, and there is a lot of excitement packed into its relatively small area. The interior does not get deeper than about 100’, and abounds with soft coral gardens, bommies, pinnacles and a multitude of large and small reef creatures. The outer walls drop off for thousands of feet. From blue ribbon eels to nudibranchs to leaf fish, macro photography opportunities abound. Beqa Lagoon is also home to a Shark Marine Reserve which is the location of the world famous Ultimate Shark Encounter™. Originally developed over 20 years ago, this site is now possibly the most well known shark experience in the world. Huge Bull Sharks are the main attraction, but other frequent species include Blacktip, Whitetip, Silvertip and Lemons. Less frequent but still regular visitors are the massive 16-18’ Tiger Sharks; all others move out of their way when they come to the picnic. In fact, there are up to eight shark species that sometimes visit simultaneously! 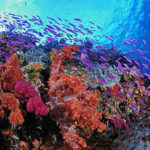 Top that off with over 300 other species of fish, and it feels like you are immersed in an aquarium teeming with life. If you ever wanted to capture that award-winning shark video or still image, this is the place. As one of Fiji’s southernmost islands Kadavu is exposed to an immense expanse of open ocean. The Great Astrolabe Reef (the worlds fourth largest and Fiji’s largest living organism) separates this vast ocean on the south and east from the island land mass, and you never know what will show up on the doorstep. Whales, sharks, marlin, giant trevally and other pelagics come in close to the reef and are often seen by divers. The reef acquired its moniker from French explorer Dumont d’Urville after nearly losing his ship (The Astrolabe) to it in 1827. While mantas can be seen throughout Fijian waters, they are most common here. In fact, there is a dive site on the south side of Kadavu where mantas are regular visitors. The site is so reliable that you can expect to encounter them over 85% of the time, year round. Although not as abundant as in the Northern Group or Beqa Lagoon, colorful soft corals are still common, and newly recruited colonies flourish. 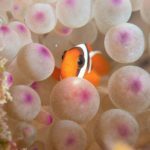 As prolific as the Astrolabe is, there is also excellent diving to be found in other areas of Kadavu, most notably at the Namalata Reef on the western side of the island. Since this is the leeward side, the surface is usually calm and visibility good, making this area perfect for night dives. No matter what your skill level or diving aspirations, Fiji should be on your short list. The many marine parks and reserves reflect the Fijian’s commitment to ecology and sustainability. No trip to Fiji (or the South Pacific) is complete without spending some time taking in the undersea landscape and getting to know Fiji’s marine residents. As aptly affirmed by Howard and Michelle Hall, renowned underwater filmmakers and photographers, “Fiji has the world’s most beautiful coral reefs – That’s why we made the IMAX film ‘Coral Reef Adventure’ here”. 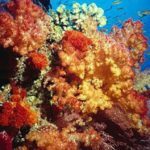 For a great video of the beauty and excitement of Fiji’s coral reefs ‘Fiji: Diving’s Red Hot Chili Pepper’ click here. Photo credit to Sam Campbell / HD Expeditions Fiji.